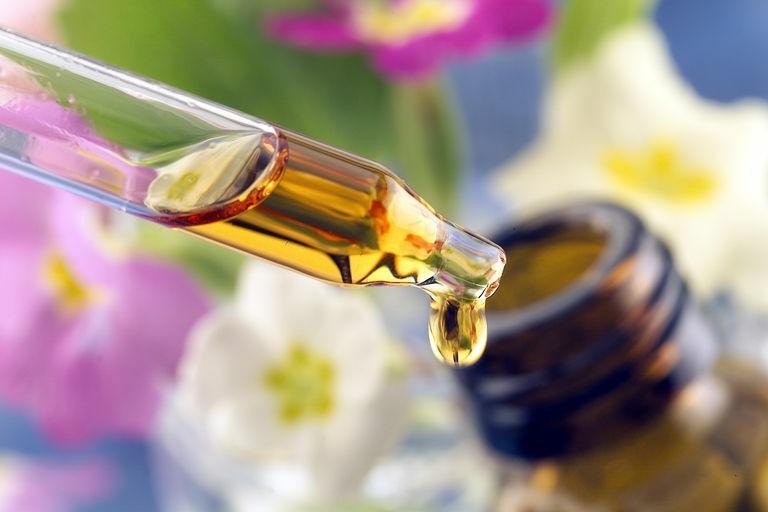 Essential oils are highly concentrated oils that are extracted from flowers, leaves, roots, and other parts of plants. Typically extracted using steam distillation (a process that involves applying steam until the oil vaporizes), essential oils have the characteristic scent of the plant. In aromatherapy, when molecules of the oil are inhaled or absorbed through the skin, they are said to influence the nervous system and brain areas (such as the limbic system) and affect hormones, brain chemicals, metabolism, and other body functions. Essential oils are often used to ease stress, boost mood, get a better night's sleep, and even repel insects. Being highly concentrated, the oil shouldn't be inhaled directly from the bottle. To release the oil into the air, a device such as an aromatherapy diffuser is often used. Other inhalation methods include steam inhalation or applying a drop or two of the oil to a cotton ball, tissue, or handkerchief and placing it nearby. Essential oils are too potent to be used full-strength on skin. They are diluted in a carrier oil (such as almond, apricot kernel, or avocado oil) before being applied to skin during an aromatherapy massage, spa treatment, bath, compress, or spot treatment. Essential oils can also be found in soap, lotion, shampoo, bath salts, and candles. The price of any pure essential oil depends on the plant's availability, the amount of plant material required, and the growing, harvesting, and manufacturing conditions needed to produce the oil. Jasmine oil, for instance, costs more than many other oils due to the millions of blossoms needed to produce one kilogram of jasmine absolute oil. Although you can find countless uses for essential oils on the internet, it's important to use caution when using them at home. When applied topically, essential oils can cause contact dermatitis, burns, and skin irritation. Avoid prolonged exposure or the use of excessive amounts due to the risk of adverse effects such as increased blood pressure and heart rate. A patch test should always be done when using a new essential oil to see if you are allergic to the oil. Essential oils can be toxic if ingested or used internally. They shouldn't be confused with essential fatty acids, which are edible dietary oils. Oils should only be used in devices or materials designed for essential oils. The oils can degrade plastic equipment and there may be health risks with prolonged exposure, so essential oils shouldn't be used in a humidifier, CPAP machine, or any other breathing device. It's a good idea to consult your healthcare provider before using essential oils for any condition. Learn more safety precautions when using essential oils. Chuang KJ, Chen HW, Liu IJ, Chuang HC, Lin LY. The effect of essential oil on heart rate and blood pressure among solus por aqua workers. Eur J Prev Cardiol. 2014 Jul;21(7):823-8.
de Groot AC, Schmidt E. Tea tree oil: contact allergy and chemical composition. Contact Dermatitis. 2016 Sep;75(3):129-43.